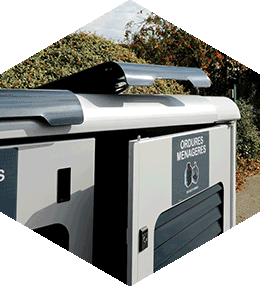 Our container kiosks allow waste collection to be grouped and organised in a single location. They can be configured to suit the various types of waste and are intended for large collective housing estates. Two to ten waste containers. Four wheels on standard model, more upon request. Compatibility: all types of bin from 350 to 1100 litres. Can be installed in suburban or urban areas (collective housing). All products from "Traditional Collection"